My plan was to blog about favorite houseplants today, but then I stumbled across a beautiful outdoor setting that captivated my heart. 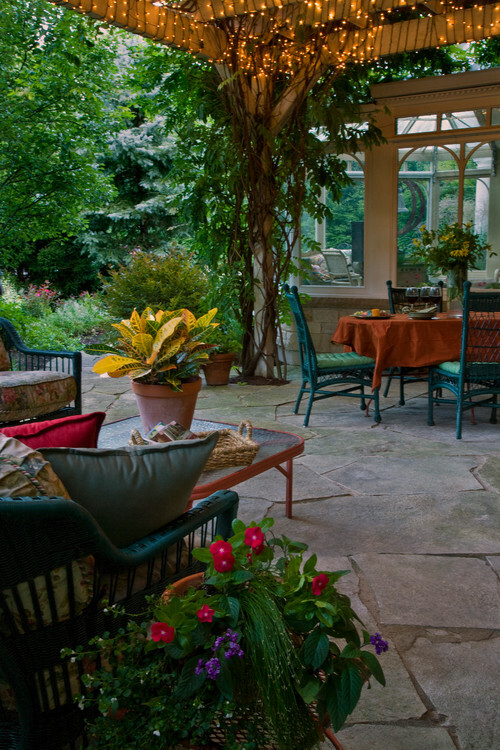 So instead of ivy and pothos, we’re taking an Oak Brook garden tour by Bertrand Landscape Design that’s sure to put you in the mood to get a little dirt under your fingernails! 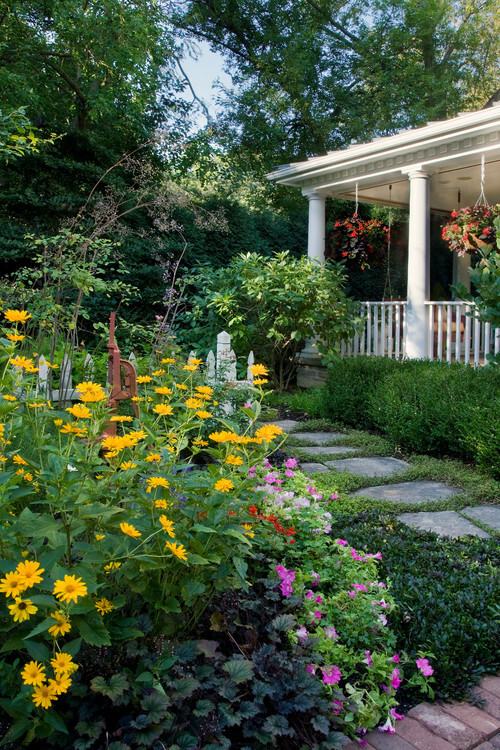 This Oak Brook home outside of Chicago is beautiful and the garden spaces frame it perfectly. 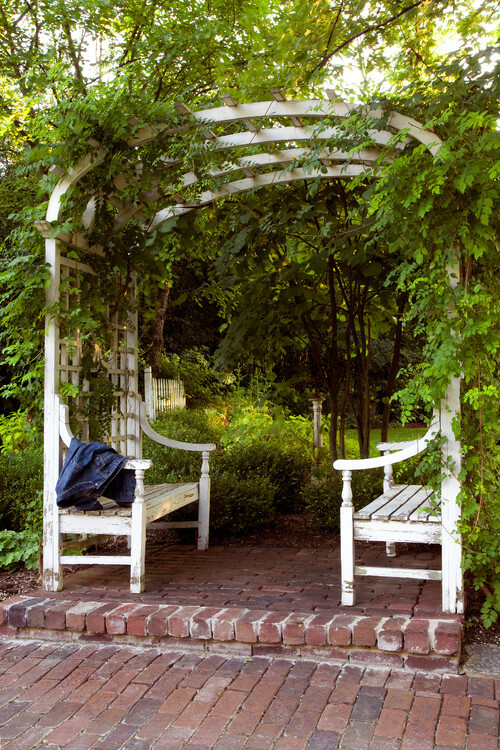 The archway and brick walkways invite you to wander into the garden and explore all it has to offer. It’s hard to tell where one planting begins and another one ends. Everything flows together beautifully. Pretty yellow flowers dance against the backdrop of a picket fence. If I’m not mistaken, those yellow beauties are Heliopsis. 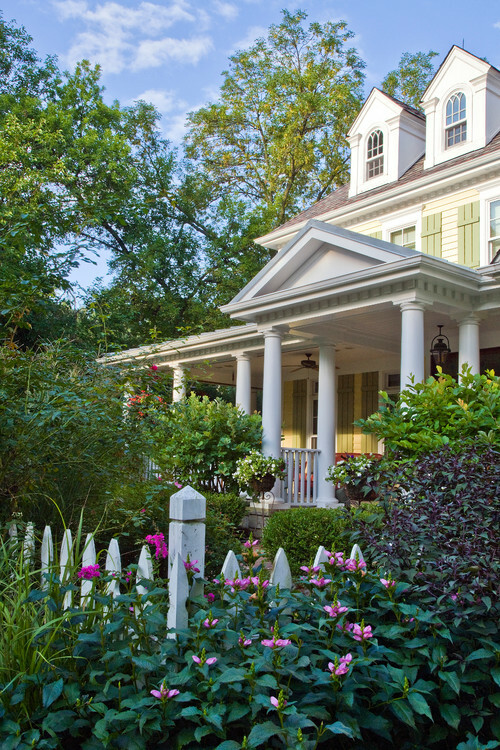 Step onto the front porch of this Oak Brook garden tour and you’ll find pretty container gardens. Yellow gerbera daisies fill a tabletop pot, while fiery red flowers (they look like geraniums to me) tangle with vining plants. 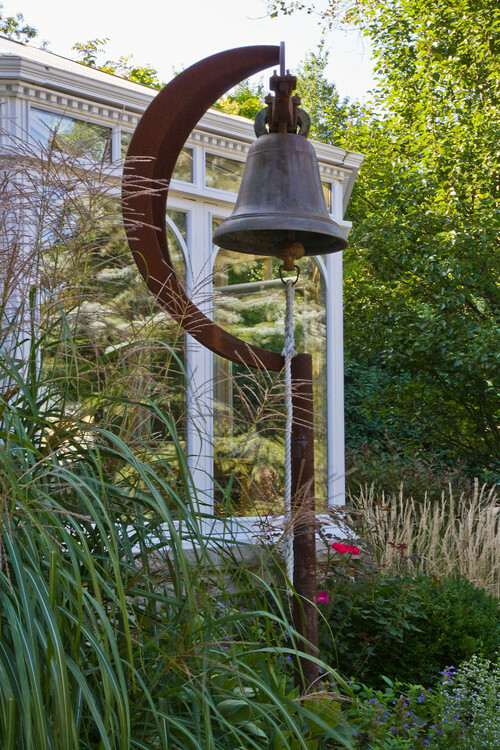 Structural features dot the Oak Brook garden tour, like this whimsical dinner bell. 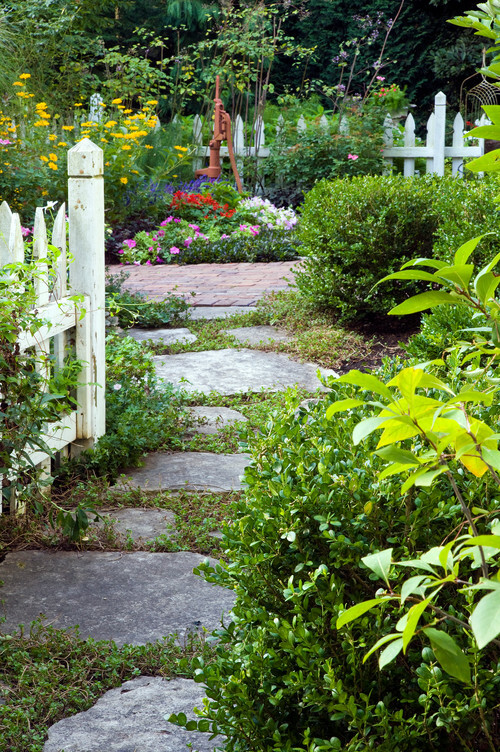 A white picket fence defines garden spaces, with a water pump nestled into a bed of flowers. 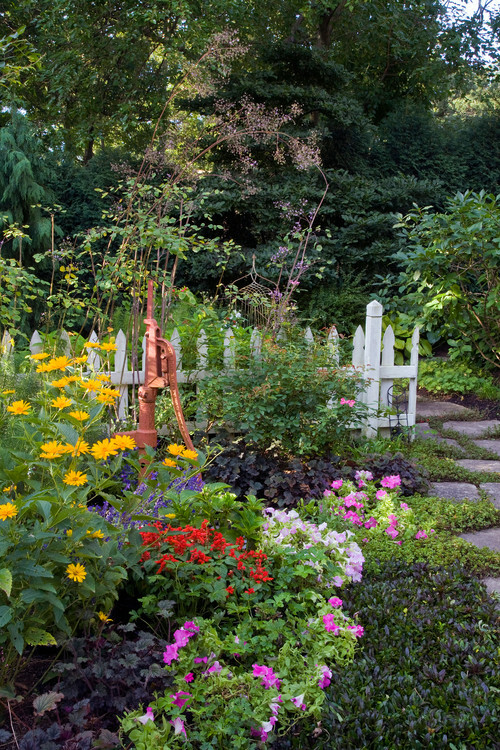 A mix of flagstone and brick pathways creates additional interest throughout the landscape. 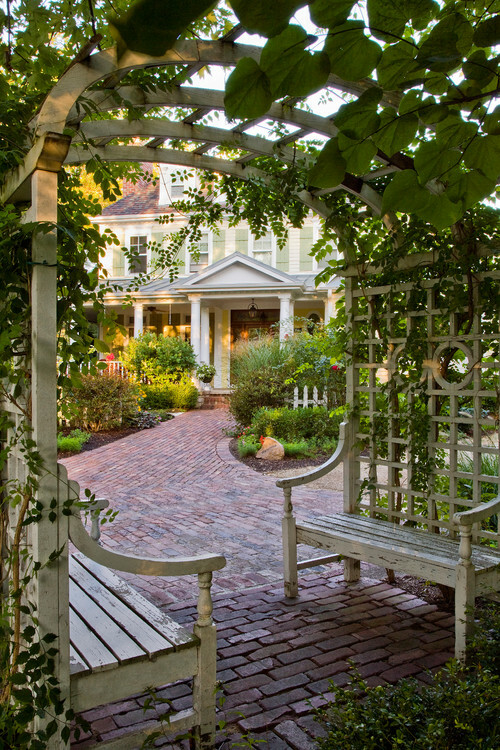 So many areas of this Oak Brook garden tour to explore! And when you need a rest, you’re sure to find a cozy spot or two to enjoy afternoon tea. 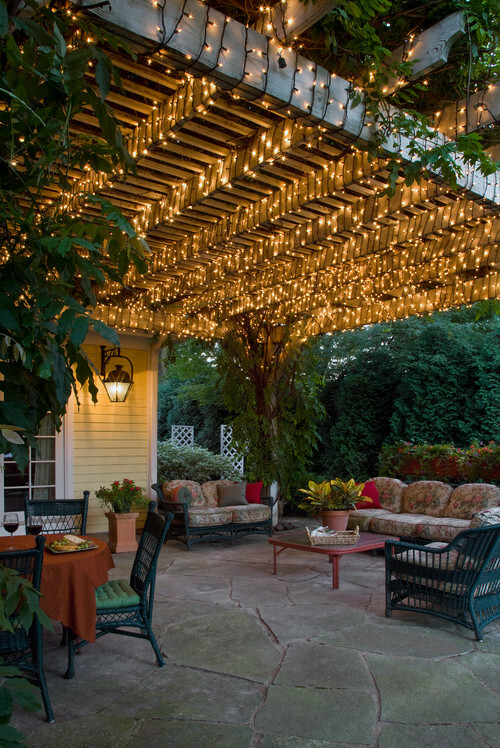 Nestled in the midst of it all is a beautiful flagstone patio with pergola. 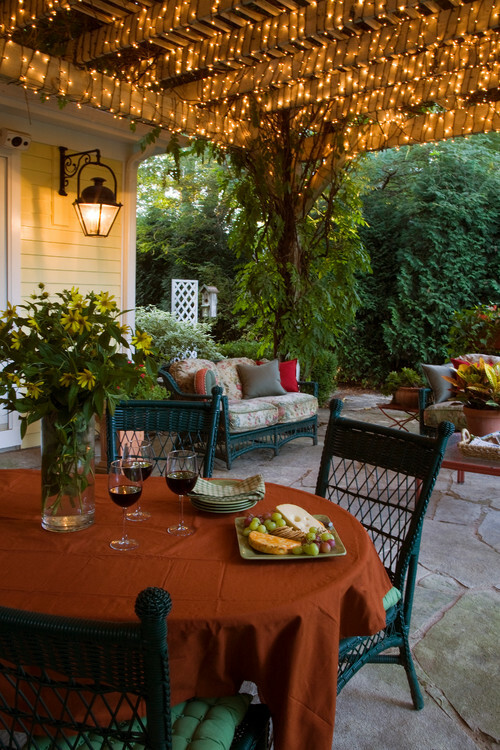 More potted plants add color as vines clamber up the pergola posts. 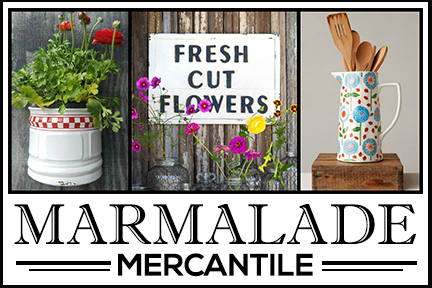 Wine, cheese, and fruit with flowers plucked fresh from the garden? Yes, please! Can you imagine what this amazing patio looks like at night? The entire garden is gorgeous – I can almost hear the birds singing and the crickets chirping. My goal this summer is to turn our small backyard into a comfortable courtyard. This yard has inspired me! 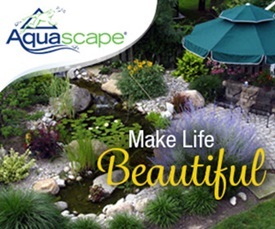 You can see more of Bertrand Landscape Designs’ projects on Houzz. Yes, very inspiring. 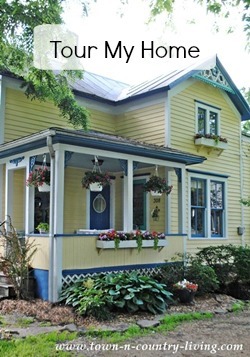 I can’t wait to get my hands dirty with “outside” dirt, rather than that from inside the house created by minor remodeling and two dogs who are tired of the seemingly long Midwest winter also. I don’t mind muddy pawprints outside – but it seems as though I’ve had more than my share inside this winter due to rain and snow. I keep checking my perennials hoping to see new growth, but mine are keeping their little heads in the ground for the time being – and for good reason. It was barely over 20 degrees last night. 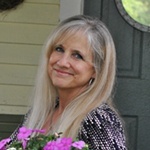 Do I sound anxious for Spring to truly get here? Absolutely. So gorgeous! 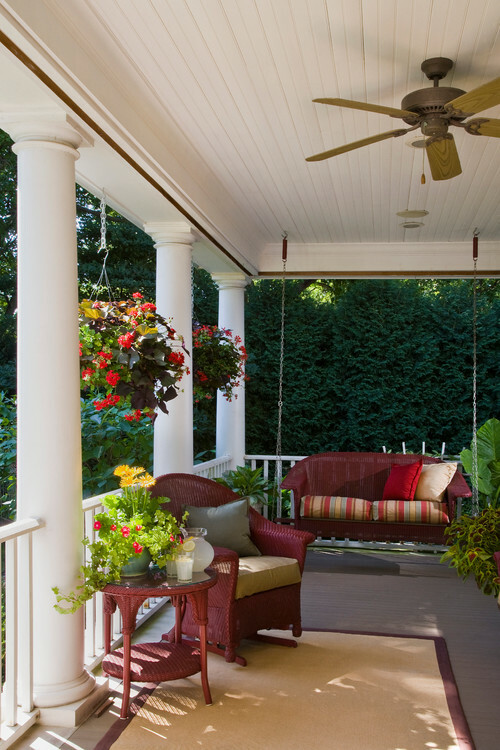 I’d love to have that patio and pergola–looks wonderful. Oh, wow, it certainly makes me want to do something different in my yard, but some things have to wait for the last frost which i wish would hurry up.haha!! Very inspiring! I love the way the vines climb those posts. And the faerie lights at night are beautiful. I’m planning to have my wedding in the back yard this summer, and I wish my back yard was like this!